The Spanish Civil War began eighty years ago last July 17, so Spain has been much on my mind this year. The Abraham Lincoln Brigade volunteers who sacrificed their lives to save the Spanish Republic from fascism made it an American war; 3,000 went to Spain and only 1500 came home—the bravest of the brave, Pete Seeger called them. The Lincoln Brigade’s last surviving veteran—Delmer Berg—passed away this year in Modesto, California at the age of 100—Modesto’s only white member of the NAACP. Picasso created the mural Guernica–the greatest painting of the 20th Century—in response to the bombing of the Basque village of Guernica. Then after the dictator Franco, with the help of Hitler and Mussolini, defeated their elected leftist government with the fall of Madrid on April 1, 1939. Picasso removed Guernica from Spain and swore it would never be returned until fascism left—as it only did with Franco’s death. When the Gestapo broke into his home and saw it hanging on his wall they asked, “Did you do this?” Picasso replied, “No, you did.” During those years in exile Guernica hung with enormous distinction at the Metropolitan Museum of Modern Art—and was also displayed at the United Nations in New York City. The very day then Secretary of State Colin Powell told the memorable lie about weapons of mass destruction to the Security Council justifying our pending bombing of Iraq Picasso’s antiwar masterpiece hung in the background—a silent Greek Chorus commenting with the screams of the damned. Spain’s loss was America’s gain. Two great Spanish musicians during those years also helped put Spain in the forefront of our national consciousness—classical guitarist Andres Segovia and cellist Pablo Casals—whom First Lady Jackie Kennedy welcomed to the White House during the brief shining moment she dubbed Camelot. I still remember seeing Segovia in concert and reading story after story about him, including one where Woody Guthrie was also inspired to practice guitar by watching the master. So when I see an announcement about a virtuoso Spanish musician bringing the music of their Canary Islands to Malibu my heart skips a beat. 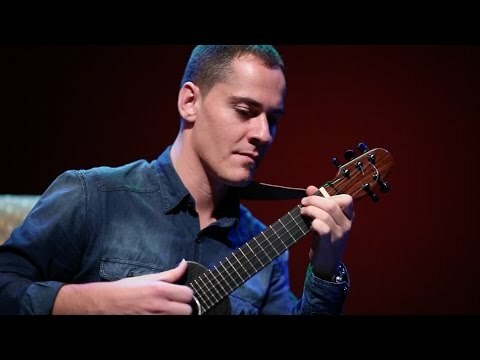 Germán López—who plays the five-stringed timple (pronounced Tim-play)—entered the Conservatory of Music of Las Palmas at the age of seven—has been performing in public since the age of ten—and brings a world music sensibility formed in the cauldron of Spain’s rich past of flamenco, classical, malaguena and polkas, tajarastes (native music of the Canary Islands), bulerías (a fast Flamenco rhythm), tanguillos (a kind of tango), and rumbas, including original compositions by López himself. 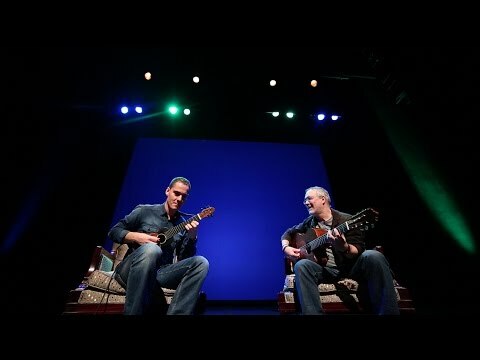 His latest album is entitled Root, and for this concert he is also accompanied by Spanish guitarist Antonio Toledo. He arrives carrying the torch of an ancient musical tradition to which he has added his own original stamp. At the same time England’s greatest modern poet, W.H. Auden, went to Spain as an ambulance driver during the war, until he was sent back home to England after his compatriot’s warning that he was “the worst driver they ever saw.” He wound up serving nonetheless by committing all of the royalties from his memorial poem Spain to medical relief for the wounded and families of the slain: “History to the defeated may say Alas but cannot help nor pardon.” He helped. Closer to home, Bob Dylan wrote his ballad masterpiece Boots of Spanish Leather for Suzie Rotolo, on the cover of Freewheelin’, but also in tribute to Spain—“Either from the mountains of Madrid/or from the coast of Barcelona”—and it became his one song to be anthologized in the Norton Anthology of Poetry. When it came out on The Times, They Are A-Changing in 1964 Dylan personally took a copy to Spain’s island of Majorca to present it to England’s living-in-exile World War I poet and author of Goodbye to All That, The White Goddess and I, Claudius, Robert Graves—who survived the Spanish Civil War by returning to England during those three years. Graves did not know who Dylan was and it was a somewhat disappointing meeting, but it always impressed me that Dylan knew who he was; the first indication that the folk singer-songwriter who reshaped modern folk music was a scholar as well as a poet and musician. MALIBU, CA – September 16, 2016 – The esteemed timple player from the Canary Islands, Germán López, brings his musical virtuosity to Pepperdine University’s Raitt Recital Hall in Malibu for one-night-only on Wednesday, September 28 at 8:00pm.Germán López in Concert will feature López along with Antonio Toledo on Spanish guitar. The masterful López blends the ancient traditions of his home island with sonic dexterity. The concert will take place at Pepperdine’s Raitt Recital Hall located at 24255 Pacific Coast Highway, Malibu, CA 90263. Tickets cost $17 for the public and $10 for Pepperdine students. With thanks to Sam and Lynn of Green Galactic for their invaluable help. And since you asked, “Yes there is something you can send back to me, Spanish boots of Spanish leather,” size 12. The very rich are different from you and me,” said F. Scott Fitzgerald; “Yes,” replied Ernest Hemingway in the most famous apocryphal conversation in American letters, “They have more money.” Well, they were both right; I can attest to that after a once-in-a-lifetime experience I had yesterday—a “house concert” I was invited to by Lynn Tejada of Green Galactic PR firm representing the young Spanish timple player who is about to become a star in his West Coast debut concert in a private home in Brentwood—North of Sunset Boulevard. The “meet and greet” part of the afternoon took up the first hour; then we retired to the living room—with two Steinway Grand Pianos within view from our perfectly placed seats—to await the arrival of the Guests of Honor—Canary Islands timple player Germán López (pronounced with a silent “G” closer to an “H”) and Antonio Toledo from Spain—where the guitar was invented more than 300 years ago—on Spanish guitar. After the mysterious invitation that read like a scene from Hermann Hesse’s Steppenwolf, the amazing drive past some beautiful horses and thrilling landscapes accompanied by a chorus of “ooh’s” and “ahs”, flowing Champagne and spectacular hors d’oeuvres and countless touches (including original paintings that would be right at home in the LA County Museum of Art) that bespoke of unseemly wealth, the musical performance seemed almost like an afterthought. The two great artists we had come to hear, however, seemed utterly unfazed by their awe-inspiring surroundings and could not have sounded more relaxed or charming. Near the end of a long cross-country tour they simply sat down on their chairs, put one foot up on their foot stools, picked up their Spanish acoustic instruments (played without pickups or microphones) and settled into the most extraordinary mini-concert of traditional Canary Island timple, Spanish guitar, flamenco fused with some African sound textures and profoundly original compositions I have ever heard—or hope to hear. The best way to describe it—at least to a novitiate in this kind of music—is as an ongoing musical conversation between the timple and guitar. Each composition (all instrumentals, by the way) came alive in the interplay between the instruments, with the 5-string ukulele-sized timple playing the high tenor notes and the guitar playing the low and mid-range notes. It was perfectly blended and every note was in its proper, inevitable place—a symphony orchestra of eleven strings in four hands; unbelievable in its orchestration and arrangement. There was precious little strumming—or even arpeggios—rather distinct notes in every tempo and measure—16th notes, 8th notes, ¼ notes, ½ notes and—just to give their tireless fingers an occasional rest—full notes to set the others apart. To transcribe their pieces would take someone schooled in classical music. And yet nothing seemed forced or hurried; instead like sitting at the shore of a rippling mountain stream sparkling against the rocks. It was a feast of nature, and the highest art form of which acoustic stringed instruments are capable. I heard Bud and Travis (Bud Dashiell and Travis Edmondson) play Malaguena Salerosa on two Spanish guitars at the Santa Monica Civic Auditorium in 1963, a concert recorded live for their bestselling double album, and have never heard any performance to compare with it—until yesterday; that’s how good this was. López and Toledo played their own version of a Malaguena, and it was breathtaking, lyrical and inspiring. I only wish Germán López had worn boots of Spanish leather; he wore red Nikes—the only sour note in the whole concert. Fortunately, what we heard was only a sneak preview of the complete concert on Wednesday. It’s even further North of Sunset, off the PCH. Don’t miss it! Ross Altman appears at FolkWorks upcoming Folk/Roots Festival in the evening concert, Saturday October 8 at the Santa Monica Bay Women’s Club, 1210 4th St, Santa Monica, CA 90401. See www.folkworks.org for details and tickets.